INTRAC’s initial Analytical Skills Training Programme (ASTP) in Central Asia supported local civil society organisations to carry out Action Research. The purpose of the programme was to help CSO practitioners develop the capacity to reflect analytically and critically on their own work and the context in which their organisations operate, and to improve their efforts to empower communities to engage in policy influencing and achieve more sustainable development outcomes. It enabled participating organisations to better understand the issues facing their target groups, develop realistic and appropriate strategic interventions, and provide evidence and materials for advocacy work and campaigns. INTRAC worked closely with local NGO partners. The majority of organisations involved in the project were women’s organisations supporting women’s participation and empowerment at a local and national level. INTRAC initially delivered an ASTP in three countries: Kyrgyzstan, Kazakhstan, and Tajikistan. 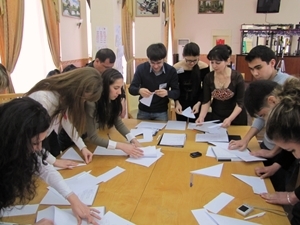 In 2011 INTRAC used the ASTP methodology in the project ‘Research in Action: Civil Society Working for Conflict Prevention in Fergana Valley’, funded by the British Embassy, to help address the difficult situation that arose after the tragic June 2010 events in the South of Kyrgyzstan. This was extended in a 3-year project aiming to enhance civil society capacity of NGOs in Fergana Valley in Central Asia (Kyrgyzstan and Tajikistan) to research potential conflicts and improve accountability of local government by lobbying for basic rights and services to marginalised and vulnerable communities. The research projects were chosen by the project participants and carried out in teams. INTRAC’s partners in the project were Public Association Centre Interbilim, Osh branch, the Civil Society Support Center in Jalalabad, and NGO EHIO Farhang van Tariqot, Khojend. INTRAC undertakes similar work to date, delivering tailor made research and analytical skills capacity building. Find out more about our work in Central Asia.